This contemporary watercolour series was inspired by Eadweard Muybridge's pioneering work 'Sallie Gardner at a Gallop' or 'The Horse in Motion' in 1878 - a photographic study of motion where he finally proved that horses take all four feet off the ground when galloping. Curiously, this fact -that we now take for granted -happens too fast for the human eye to follow. Some people at the time theorised that horses did indeed lift all four legs off the ground when galloping; but it was Muybridge's study that not only proved this to be true but showed that this did not take place when the horse's legs were extended to the front and back, as you often see in old illustration, but when the horse's legs were collected beneath its body as it switched from "pulling" with the front legs to "pushing" with the back legs. 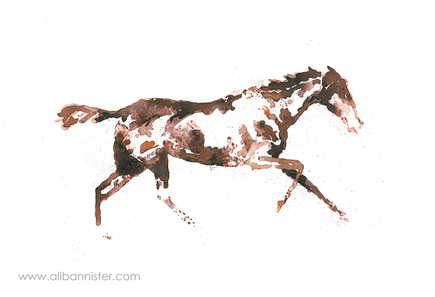 I've always been fascinated by the movement of horses, especially in slow motion. I used a looser style to keep the focus on the movement rather than fine detail of the subject. Prints are from a limited edition of 250 and are are signed, numbered and mounted. The image size of both the original and prints is 42cm x 29.7cm.